“Old Ironsides” was a young country’s first formidable weapon of war. Today restored to museum quality and lovingly cared for by a U.S. Navy crew, the USS Constitution, “Old Ironsides,” is the living symbol of America’s first generation of warships, built in response to external threats that a young United States would have preferred to ignore. It would, however, be foolish to presume that her fame and success came from divine intervention and manifest destiny. The fine fighting and sailing qualities of the Constitution and her sister ships were more than just providence shining on a new nation with promise. On the contrary, much of the legend that became “Old Ironsides” was designed into her, long before the first timbers were cut and shaped. The story of the USS Constitution began in 1794, when the new U.S. Congress began to debate the matter of protecting American shipping. Like many new nations, the United States had tried to live without a standing army or navy, abhorrent of the kinds of institutions that had tried to suppress their own rebellion of just a few years earlier. There was also a concern that such forces would encourage overseas involvements and adventures, something the isolationist Americans of the day sought to avoid. Unfortunately, the nature and geography of the new nation made a naval force a necessity. Post-revolutionary America was a place of great natural wealth and manufacturing potential, something obvious since the earliest colonial days. However, the goods from the resources and production would be worthless unless they could be safely transported to the marketplaces of the world. Already, nations from Scandinavia to the Aegean craved the new supplies of high-quality goods and materials from the New World, which were a source of envy and greed among pirates and terrorists of the Atlantic Ocean and Mediterranean Sea. In the 1790s, the threats facing U.S. merchant shipping were already quite real and growing. The first were British warships, which were searching for goods sent to the empire of Napoleon Bonaparte. When Royal Navy vessels would stop and search American merchant ships, they would often “press” (a form of forced conscription akin to kidnapping in the name of the crown) American sailors suspected of being British deserters or expatriates. Often, U.S. citizens would be caught up in these sweeps, and pressed into service aboard crew-starved British warships. A more serious problem was the Barbary Pirates of North Africa, composed of irregular naval units based in small kingdoms along the Southern coast of the Mediterranean Sea. These pirates would strike out from their bases, and seize merchant ships on their way across the Mediterranean. The ships, cargo, and crews would then be held until a ransom or “tribute” was paid, with the hostages frequently being sent into slavery. Initially, the United States paid tribute like the rest of the world, along with signing treaties of peace and trade with the Barbary States. However, the unilateral breaking of these treaties by the pirates and the natural distaste for paying ransoms to nations acting illegally, made Congress rethink their previous ideas on a standing navy. In particular, the high costs of establishing bases and shipyards, along with building and manning, made this a difficult decision for the young nation. However, in 1794 with the support of President George Washington, the Congress voted to authorize the establishment of a navy with the construction of six warships, as well as their manning and operations. This effort would be supported by the construction of a number of “subscription” warships, paid for by private and municipal donors and turned over to the new United States Navy. These efforts would result in a force of over a dozen such warships by the start of the War of 1812, a modest but useful start to the powerful fleet we know today. While it is one thing for a legislative body to authorize a fleet of ships, building and manning those vessels is another. Luckily, Congress had the good sense to hand the job of building America’s new navy over to what passed for a cadre of professional military civil servants in those days; the new Department of War. The Secretary of War, Henry Knox, appointed one of America’s finest naval architects, Joshua Humphreys, to actually supervise the design and construction of the six vessels. Ably assisting Humphreys were a skilled naval architect, Josiah Fox, along with Humphreys’ long-time draftsmen, William Doughty. These four men would not only decide the shape and form of America’s new fighting ships, but also the ships’ capabilities to accomplish the roles and missions assigned by future Presidents and Congress. By any standard, it was an impressive and heady task for Knox and men normally engrossed in the details of designing and building merchant vessels. Humphreys’ first task was to study just what types and sizes of warship should be constructed. Though it was generally accepted that frigates (roughly equivalent to World War II cruisers or present day guided missile destroyers) would be the ships built, Humphreys felt it necessary to study the force mix and report back on whether or not they would be capable of the missions desired. His research looked into the favored six-frigate option, as well as the alternative of constructing two larger three-deck ships of the line (on a par with 20th-century big-gun battleships). While the ships of the line would have been both impressive and powerful, the two that could be built and supported on the funds allocated by Congress would not be flexible or numerous enough to accomplish what had been intended. It was decided that the six frigate-building program was in America’s best interests. The ships Humphreys intended to build were unlike any sailing warships ever seen. They were designed to be faster than any enemy ship big enough to hurt them but more powerful than anything that could catch them. Thus they were meant to be able to defeat anything their size and able to run away from anything larger. In this way, Humphreys anticipated, by a century, Britain’s First Lord of the Admiralty Jacky Fisher’s concept of a battle cruiser. Humphreys began with the hard fact that he needed to build six frigates in as short a period as possible, and as economically as his skills as a designer and manager would allow. To do so he laid the six vessels out into three groups or classes, all of which would be true or near sister ships of a generally common design (See top chart, opposite page). Humphreys spread the construction duties out among six construction yards, between Portsmouth, New Hampshire, and Norfolk, Virginia. This would allow the work to proceed in parallel, with a maximum of commonality between ships of materials and fittings. As an added benefit, spreading the work throughout the former colonies would build greater political support for future naval procurement, along with the benefits of enhanced competition among the various yards. Two centuries before the term “acquisition reform” began to circulate within the halls of the Pentagon, Joshua Humphreys used common sense in building a navy. However, the ships he proceeded to build were anything but common. Humphreys knew that it would take decades of construction for the United States to build a fleet that could ever stand toe-to-toe with those of Great Britain, France, Spain, or Russia. But he did feel that a small force of very high-quality ships manned by exceptional crews might be able to enforce American interests around the maritime world, and perhaps even match individual ships of the great naval powers one-on-one. He therefore undertook to design ships that would be of superior design, built of better materials, and manned by the finest officers and men that could be recruited. Secretary of War Knox backed Humphreys in these plans, and the first few groups of American warships share this common design philosophy. It might also be said that this concept fit well into the maritime character of the United States, which built some of the finest merchant ships in the world, manning them with well-paid and motivated crews. It was no wonder that so many seamen from around the world deserted their own vessels and countries to try their luck in America. The actual design of the Constitution was unusual for a frigate in that while it (and its five sister ships) retained the normal two gun decks common to the type, the hull form resembled a cut-down three-deck ship of the line. This allowed more guns (44 as designed, but up to 55 in practice) to be carried than traditional French and English designs (which normal were designed to carry 36). To retain the speed and maneuverability necessary for commerce raiding and fleet scouting duties normally assigned to frigates, Humphreys created a hybrid hull design. It included design details from French shipbuilding (which combined speed and inshore maneuverability) with the robust structural standards of British naval architects. This created ships with great speed, maneuverability, and gun power, along with the ability to stand up to a pounding in a close battle. As a final bit of insurance, Humphreys added his own unique design feature to the hull, a series of 12 diagonal stressed members (six on each side) known as “diagonal riders” to back up the hull and increase the overall stiffness of the wooden walls of the ship. To this would be added an exceptionally strong three-masted sailing rig, which would give Constitution more motive thrust than any ship her size until the development of the clipper ship 60 years later. To build his ships, Humphreys ordered an array of materials and hardware that would have been the envy of any naval designer of the day. 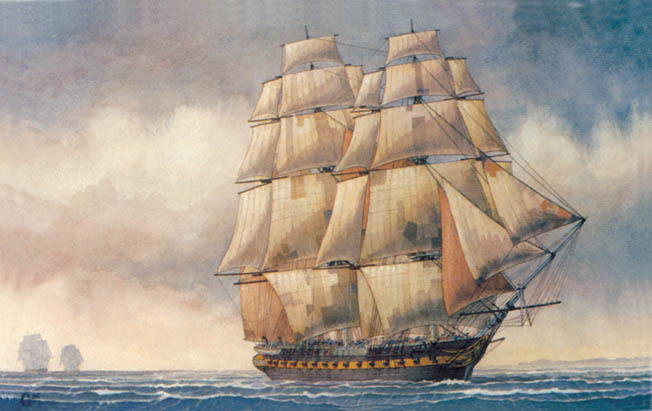 At a time when French and British shipbuilders were desperate for decent timber and metal for hardware, Humphreys had his choice of the world’s best wood, cordage, and metals for building his navy. The live oak, for example, was one of the most dense and resilient building materials found in nature, and formed the inner structure of the Constitution. The planking and keel were made of fine white oak, with the outer frames and masts made of white and yellow pine. All the fasteners, fittings, and spikes were made from the finest copper, produced appropriately by the foundry of the famous Revolutionary War patriot, Paul Revere. 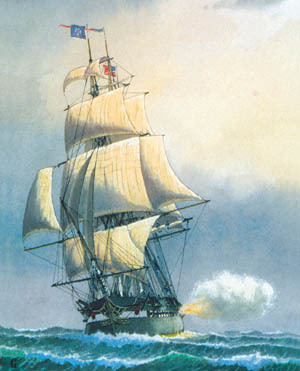 When combined with Humphreys’ exceptional design, these materials gave the Constitution the incredible strength and endurance that would make her a legend. For example, the main hull with the live oak inner frames and diagonal riders was over two feet thick at the waterline, and capable of taking punishment that would have destroyed ships many times her size. The reports of British solid shot bouncing off of her hull in battle are not a myth, as some historians would have it. While the Constitution may still have been made of wood, she might have well been built of iron. Joshua Humphreys had created the ultimate expression of the fighting sailing vessel in his frigates, as the next few decades of their service would prove. The final touches to Humphreys’ design were weaponry and crews, both of which would prove more than adequate to their future tasks. The crews were all volunteers; well paid and among the best sailors in post-revolutionary America. 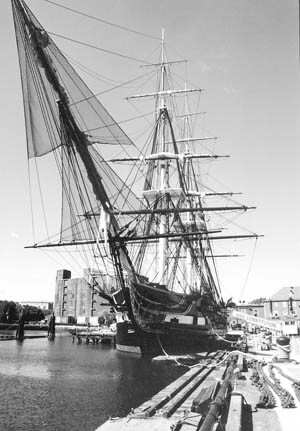 Constitution was rated to carry a crew of up to 500, though normally 400 were aboard. This included roughly 125 able seamen, 125 landsmen (that is, apprentice seamen), 80 Marines, 30 boys, and an assortment of officers and petty officers. Almost all were experienced, and, man-for-man, were among the best in the world. The armament of the Constitution and her sister ships was equally impressive, based around a mix of borrowed coastal artillery and long guns on wheeled carriages. It was this array of weapons that they first took into combat with the Barbary pirates. However, by the War of 1812 the Constitution and her sisters had been given a more modern weapons fit of up to two dozen short-barreled carronades (mixed with the long guns), mounted on fixed gun carriages. This allowed her to carry 55 and 54 guns respectively when she engaged the British frigates Guerrière and Java. So great was the pounding she dished out, that both British ships sank following their surrender, an unusual result for ship-to-ship engagements of the period. Later in the war, she even fought two Royal Navy ships (a frigate and smaller sloop of war) protecting a convoy, defeating both. All told, the Constitution took part in over 30 naval engagements and bombardments during her career, and was never defeated or disabled in battle. It was a total validation of the concepts that Humphreys had developed when he first conceived the six “big frigates” of the early U.S. Navy. While bigger and more advanced ships would follow her, sailors of the modern U.S. Navy look back with pride upon her, the infant navy’s first step toward becoming world class. Today, the Constitution lies moored at the old Boston Navy Yard, at the foot of Bunker Hill. There she is still manned by a U.S. Navy crew, and is taken out every year or so to sail the seas and prove that she still has the right stuff more than two centuries after her launch. Joshua Humphreys would be rightly proud if he could see her today, over 200 years in continuous commission, the oldest warship in the world to be so and still afloat. Tags British Royal Navy, George Washington, Great Britain, Henry Knox, Joshua Humphreys, Josiah Fox, Napoleon Bonaparte, Norfolk, Old Ironsides, U.S. Navy, USS Constitution, William Doughty.